Good belayer! Always keep your eyes on the climber and your dominant hand on the brake end of the rope. 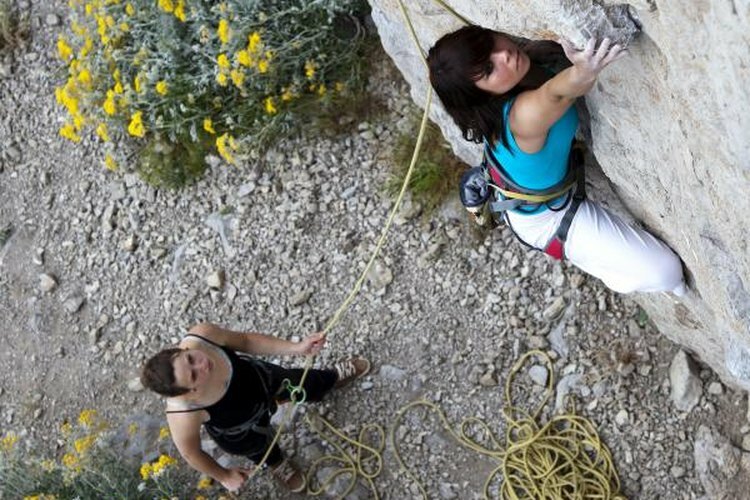 When you belay a rock climber, you're not just helping out -- you're literally holding her life in your hands, so don't let yourself be lulled into a sense of security. The climber could fall at any moment, and it usually happens faster than you can react. Because of that, being poised to react isn't enough; you should already be in position to catch her if she falls. A tube-style device like the Black Diamond ATC is the most common belay device most climbers will use. To load the rope, feed a bight -- that is, a bend -- of rope through one of the slots in the device. Clip both the bight of rope you just fed through and the belay device's wire loop into a large locking carabiner. Finally, clip the carabiner into the belay loop on your harness, oriented so that the tail end of the rope -- also known as the brake end -- is on the same side as your dominant hand. Screw the carabiner locked and orient it so that the small end of the carabiner sits against the belay loop of your harness, while the belay device and rope pull against the large end of the carabiner. Keep an eye on the carabiner throughout the belay to be sure it stays oriented this way. If the belay loop and rope pull on the gate and spine of the carabiner instead, it may break. To belay a top-rope climber, you take up slack in the rope as he climbs so that if he falls, he won't fall far. As you do this, you must always keep your dominant hand on the tail end of the rope, at least six inches inches away from the belay device, holding the rope down against your hip or thigh so the rope creates a sharp angle over the edge of the belay device. This is known as brake position. Bending the rope over the edge of the device produces the friction that helps you catch a fall. So although your grip does matter, it's actually the angle you hold the rope at -- not a death-grip on the rope -- that keeps your climber safe. To accomplish those dual goals in a top-rope belay, start with just enough slack in the rope for your climber to move comfortably to the wall and start climbing. As he gets higher, use your brake hand -- your dominant hand -- to pull slack through the belay device. Your other hand, the guide hand, can help feed slack into the belay device from above, but keep the fingers of both hands well clear of the device or they may get pinched. Pull a foot or so of slack through the belay device, then switch your guide hand down below the brake hand. Hold the brake end of the rope steady with your guide hand as you slide your brake hand back up to within a few inches of the belay device without ever letting go of the rope or taking it out of brake position. You're now prepared to take in more slack. If your climber falls, pull the rope even further into brake position -- creating a sharper angle in the device -- and keep it there until he signals that he is actively climbing again. Once he gets to the top, take in all the slack on the rope, lock off the rope in brake position as if you'd just caught a fall and sit back in your harness to help counterbalance his weight. Wait for his signal before you lower him. Never take your climber off belay, even if he's walking around on top of the crag, unless you've explicitly agreed to the signal for doing so beforehand. Double-check that your climber is properly tied in, and have him double-check that your belay is properly set up; both of you should also double-check that your harnesses are fastened correctly. The climber doesn't start until you've both confirmed that you are ready to go. If your climber is significantly heavier than you are, you may be pulled forward or even up into the air when he falls, or when he weights the rope before being lowered. Clip into a floor anchor or -- if you're outside, an anchor near ground level -- to keep this from happening.